This is one of the most beautiful Rolex models ever made. It is an annual calendar "triple-date" moon phase with star indices that was made 64 years ago in 1950. It is simple yet sophisticated, and in like-new condition. This beauty was auctioned five years ago by Christies in Geneva, Switzerland on November 16, 2005 for $594,155. I thought I would share the photo below of Nicolas Cage with his then wife, Lisa Marie Presley, and if you look closely, Nicolas Cage is rockin' his Rolex Moonphase 6062. This is one of the most beautiful watches ever made in history and I genuinely hope Rolex has the wisdom to bring this model back to life. Launched in 1950, reference 6062 is seen as the pinnacle for the savvy Rolex connoisseur since it combines all key elements a demanding watch collector could expect: a sporty yet distinguished look, a complicated movement with full calendar and moon phases indication housed in the purist of all Oyster designs. Together with reference 8171 (see the following lot) it is one of only two Rolex models to show the date, the weekday, the month and the moon phases. 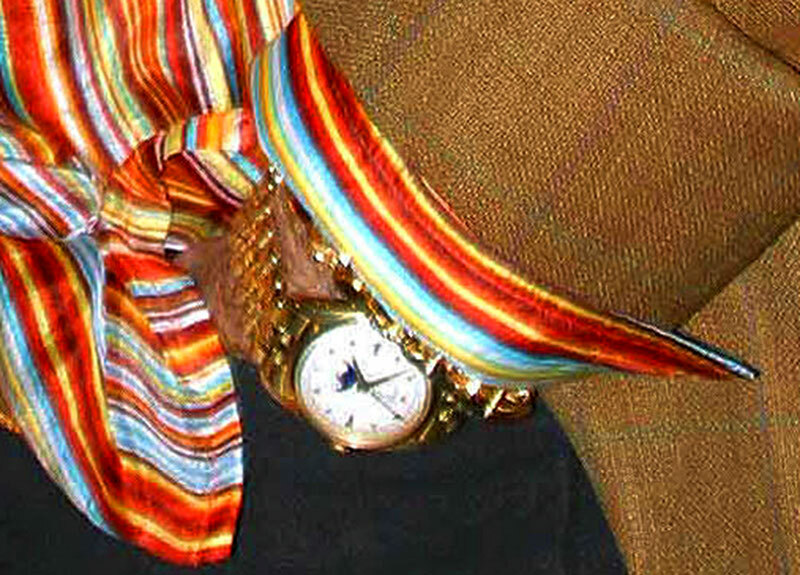 It was also the first Rolex ever to be fitted with the so-called Super-Oyster Crown. Reference 6062 was made in very few examples, mainly cased in yellow gold or even more rarely in pink gold or stainless steel. To further enhance the model's individuality and exclusivity, a variety of dial designs were available - the rarest however with the most popular star-shaped numerals. 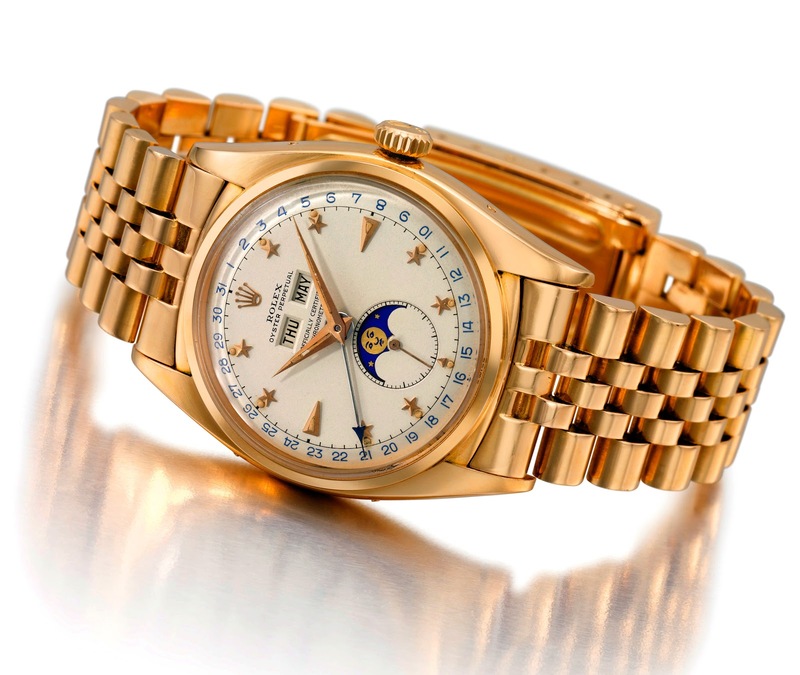 The present watch, offered by a private collector, is one of the most beautiful and desirable examples of this legendary reference: made in 1950, cased in pink gold and fitted with the highly sought after "star" dial, it also still retains its original Jubilee bracelet, a rarity by itself. Preserved in outstandingly original and unspoilt condition, the dial shows an incredibly charismatic, ivory-coloured grainy patina which has formed naturally over the years. Another particularly appealing feature is the harmoniously discoloured luminous material to numerals and hands, now displaying a highly attractive, uniform cream tone. The case, possibly only once polished, impresses with its full bodied proportions, sharp angle to the bezel and original satin-finish underneath the lugs. In 30 years of international watch auctions, only a small handful of pink gold star-dialed references 6062 of such quality have appeared. All of them have always caused sensational response from the market and are now cherished trophies in the world's most distinguished private collections. The present example can comfortably compete for a place on the podium in an all-time 6062 competition. For a virtually identical example, sold by Christie's Geneva in May 2004, see 100 Superlative Rolex Watches by John Goldberger, pp. 142 & 143. It is very interesting to note that the latter reference 6062, serial number 788'617, is only 20 numbers apart, underlining the extreme rarity of these watches.